"Shirley you are such a wonderful lady. I am happy I got to know you. You have such a big heart. You will be missed by all. R.I.P shirley..."
"Very sorry for your loss. " "So sorry for your loss. She was a sweet lady"
"RIP Shirley, I have some good memories of you!! See you on the other side! ❤"
Shirley Brown ~ Suddenly, at St. Mary's General Hospital on Monday, October 8, 2018, Shirley Jean (Grant) Brown of Listowel, in her 83rd year. Wife of the late Blain Rassman (2015). Mother of Rob and Judy Brown of New Hamburg, Sharon Marsh and Ron Sage, Betty-Ann Brown, and Carolyn Brown, all of Listowel, and Diane and Dan Bellaire of Guelph. Grandmother of Krystle Marsh and Russell Rennie, and Lisa Brown and Ethan Sommerville, all of Listowel, and Steven, Matthew, and Michelle Bellaire, all of Guelph, and great-grandmother of Tyler and Camden. Sister of Campbell and Faye Grant of Listowel, Robena and Jim Olson of Alliston, and brother-in-law Joe Carnie of Coquitlam, B.C., and remembered by her nieces and nephews. Predeceased by her sister Isabel Carnie, brother-in-law Jim Ferguson, and by her granddaughter Lucinda. Visitation will be held at the Eaton Funeral Home, Listowel, on Friday from 6:00 to 8:00 p.m. where the funeral service will be held on Saturday, October 13th at 11:00 a.m.
Memorial donations to the Heart and Stroke Foundation would be appreciated. I am so sorry to hear of Shirley's passing, she was a great lady. 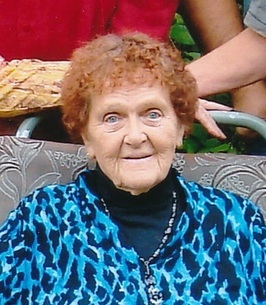 Sharon, Ron & Family, We are so very sorry to hear of the passing of your Mother. You may have lost your Mom, but you will never lose her essence! Sending you hugs across the miles! You are definitely in our thoughts! Our sympathy to the family Our prayers are with you.